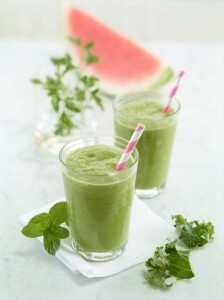 SAINT PATRICK’S DAY RECIPE: SUPER GREEN DETOX SMOOTHIE - What About Watermelon? Top o’ the mornin’ to ya! That was my less-than-impressive Irish accent in honor of St. Patrick’s Day. March 17 is a day draped in green (including the beer), that honors the “Apostle of Ireland,” Saint Patrick, who is highly revered in Irish culture. What makes this smoothie so incredibly healthy is the combination of greens and a popular Korean chili paste called Gochujang. This savory and spicy Korean condiment is packed with a number of vitamins and minerals including vitamin A, C and carotene. It’s the perfect way to go green in the St. Patty’s Day spirit. Place all ingredients in a blender, such as a Vitamix, with watermelon on the bottom. Start blending slowly until the watermelon is liquefied, then increase speed. Blend for one to two minutes. UP NEXT: WOULD YOU BUY THIS $200 WATERMELON?